about Fried Rice, but it has quickly become a fast and easy favorite around here. A few weeks ago on a night that I really didn't feel like cooking something too involved, my husband suggested fried rice. I hadn't made it forever! I forgot how easy and quick it comes together. Especially if you are using left overs. We had some left over rice from a meal earlier in the week and some left over veggies. Dinner was done in mere minutes. And everyone loved it! It's now on my "go to" list for something quick and easy. Like last Sunday. 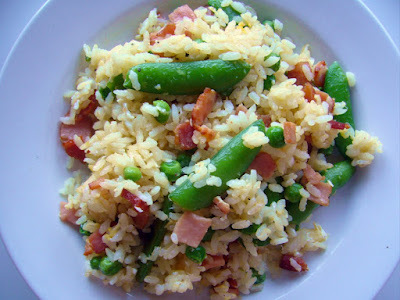 Again we had left over rice, I threw in some Canadian bacon, fresh snap peas, & my little "R's" favorite regular peas (I know I know...we are pea lovers around here), eggs and whala! Dinner was done! You can mix and match for your favorite combination. 1. Heat 1 T. veg. oil in a large skillet. 4. Add the rice and stir fry until the rice is nice and hot. 5. Crack the eggs right into the skilled on top of the rice. Keep stir frying until the eggs are incorporated and cooked; about 2-3 minutes. Be careful not to over cook. 6. Serve with desired amount of soy sauce. Oh ya, I love fried rice. All the good things I cook get lost in the rotation... thanks for the reminder. This does sound easy. I'm gonna give it a go. Thanks for the continued inspiration.